Netflix’s Marvel Series to Shoot in New York! 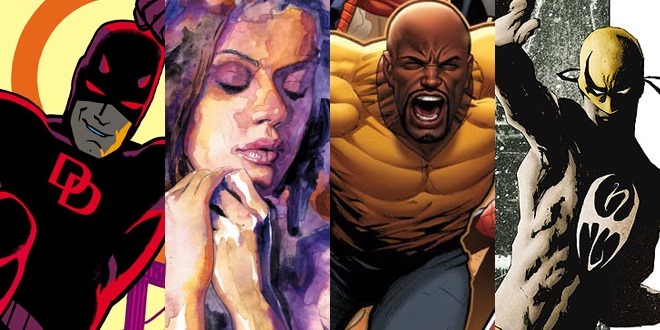 New York State will be the principal filming location for Netflix’s previously announced live action Marvel series – Daredevil, Jessica Jones, Luke Cage and Iron Fist. Since these characters are based in NYC’s Hell’s Kitchen, this is great news. The individual series will lead into a The Defenders miniseries event. Filming will begin this summer. For more, follow the jump. New York City to serve as principal filming location for four series epic and one mini-series! Governor Andrew M. Cuomo, The Walt Disney Company, Marvel and Netflix Inc. today announced that Marvel’s landmark live-action television series, which will bring Marvel’s "flawed heroes of Hell’s Kitchen" characters to Netflix, the world’s leading Internet TV network, will principally film in New York State. Produced by Marvel Television in association with ABC Television Studios, this groundbreaking series is Marvel’s most ambitious foray yet into live-action television storytelling and represents the largest film or television production project commitment in New York State history. "New York is where the entertainment industry started, and this unprecedented commitment from Disney and Marvel is further evidence that we’re bringing it back bigger and better than ever before," said Governor Cuomo. "And when the entertainment industry thrives, it fuels dozens of other industries and businesses. The competition for these projects is fierce and Disney could have chosen to film these shows anywhere, but they knew that shooting in New York means getting to work with the best in world. These shows bring New York’s super heroes home where they belong–along with hundreds of jobs and millions of dollars in new business." "Since 2008 Disney has directly contributed almost half a billion dollars to New York’s economy through television and film production, along with approximately 9,000 jobs for New Yorkers," said Robert A. Iger, Chairman and CEO, The Walt Disney Company. "The Governor’s policies make this great state a more affordable and attractive location, opening the door for even greater economic investment and job creation for New Yorkers. Our Marvel series for Netflix will inject millions directly into the local economy and create hundreds of new jobs." "We thank the Governor and the great state of New York for helping us create the ultimate backdrop to this epic series. Setting our production in New York City truly underscores the authenticity and excitement we plan to bring to The Defenders and their ‘flawed heroes of Hell’s Kitchen’ stories," said Alan Fine, President, Marvel Entertainment. Last November, Disney and Netflix announced an unprecedented deal for Marvel TV to bring multiple original series of live-action adventures of four of Marvel’s most popular characters exclusively to the world’s leading Internet TV Network beginning in 2015. This pioneering agreement calls for Marvel to develop four serialized programs totaling 52 one-hour episodes culminating in a four to eight episode mini-series programming event. Led by a series focused on "Daredevil," followed by "Jessica Jones," "Iron Fist" and "Luke Cage," the epic will unfold over multiple years of original programming, taking viewers deep into the gritty world of heroes and villains of Hell’s Kitchen, New York. Netflix has committed to a minimum of four, thirteen episodes series and a mini-series event in which the Marvel characters from the first four series team up as "The Defenders," much like "The Avengers." "The Defenders are classic New York characters; smart, resourceful and tough enough to always stand up for what’s right," said Ted Sarandos, Netflix Chief Content Officer. "We’re delighted they’re coming to life on their home turf thanks to Governor Cuomo and his team." Thomas J. O’Donnell, President Teamsters Local 817 said, "Theatrical Teamsters Local 817 is thrilled that Marvel’s newest television series will be filmed in New York. This long-term commitment is an incredible accomplishment that will bring not just jobs, but also stability to our members work and family lives." Previous PostJoshua Oppenheimer discusses controversial film The Act of Killing with Michelle!Next PostFace Off Goes To Tokyo!